The architecture of Gandhara, like its sculpture, combines local characteristics with elements derived from both Indian and western precedents. The major archaeological sources for the architecture and sculpture of Gandhara are the remains of religious establishments such as stupas and monasteries. Stupas are reliquary structures in monasteries that are the focus of veneration. The first Buddhist stupas were built to house the remains of the historical Buddha, who lived between the fourth and fifth centuries BCE. Later stupas may have contained the remains of the Buddha or Buddhist saints, or such sacred objects as jewelry, precious stones, coins, texts, or sometimes figurative works of art. Traditionally, a stupa consists of a cylindrical base, a structure called a drum, and a hemispherical dome. This dome supports a post, surmounted by one or more canopies, that represents the axis of the world. Worshippers walk clockwise around the base of the dome, with one circle of the stupa representing the Buddha’s life cycle. In Gandhara a unique type of stupa developed. The drum is elevated and rests on a square podium. Sometimes lion columns mark the four corners of the podium, and Corinthian pilasters are added to the base and drum. Gandharan stupas also frequently featured large, richly decorated false dormers. The bases, drums, and fences (harmikas) of Gandharan stupas were frequently decorated with images of the Buddha and bodhisattvas, or with narrative reliefs, which are distinguished from North Indian reliefs in their emphasis on the linear unfolding of events. 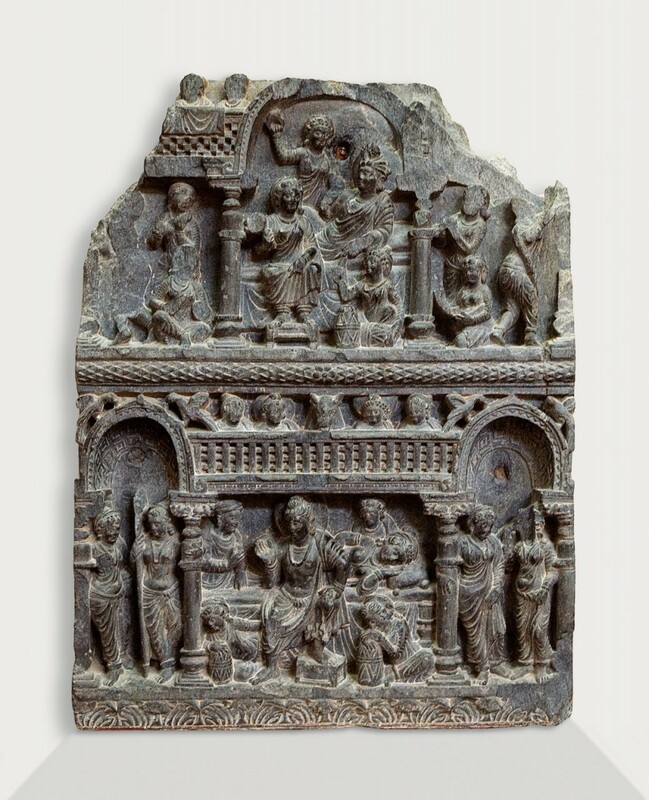 Gandharan reliefs depicted many scenes from the Buddha’s life, although his birth, enlightenment, First Sermon, and attainment of Nirvana are considered the key events. Gandharans also attached great importance to the Buddha’s “Great Departure,” when he left his palace as a young prince to become a mendicant. Donors dedicated many sculptures of the Buddha to monasteries in Gandhara, and shrines surrounding and aligned with stupa courts often contained larger-scale Buddha sculptures like the ones in this section of the exhibition. According to Buddhist belief, the Buddha’s incarnation as the prince Siddhartha began with his miraculous conception. Maya, his mother, dreamed that an elephant entered her womb through her side. Here, a halo identifies the elephant as none other than the Buddha. A maid attends the sleeping mother-to-be. 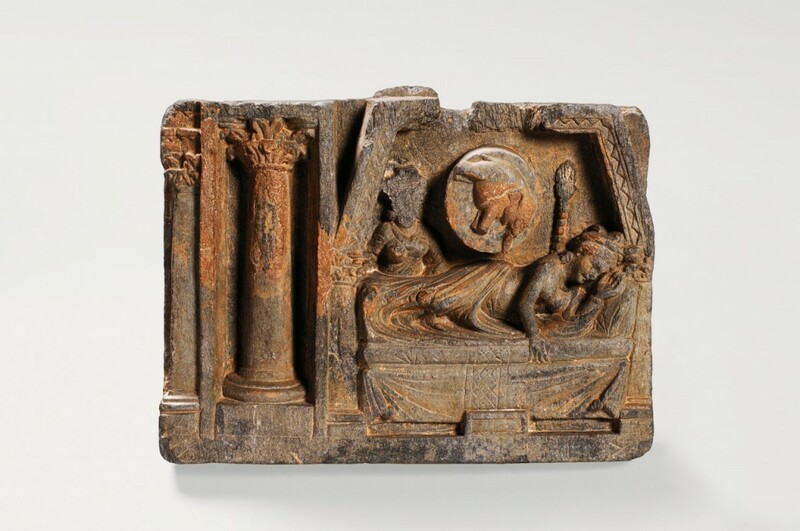 This relief probably once adorned the square base of a votive stupa. 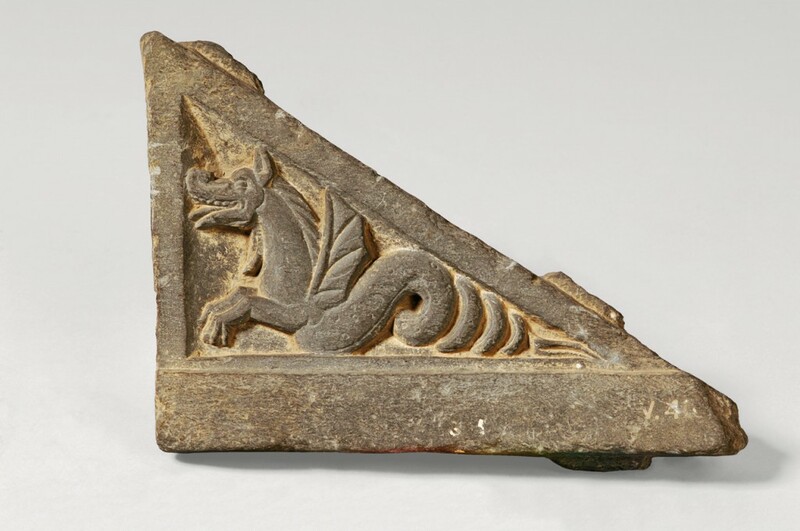 This fragment was probably the central part of a false dormer (an adornment attached to the surface of a roof). The upper panel is devoted to the courtly entertainments of dance and music. The scene below shows Siddhartha—who would become the Buddha—about to leave the comforts of his palace behind. While his wife and their maids sleep, he asks his chariot driver to saddle his horse. 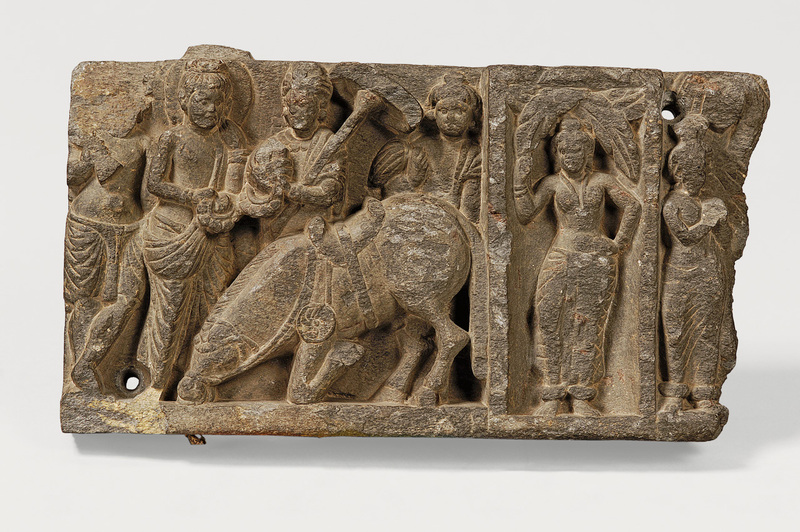 In this scene, Siddhartha takes leave of his horse, Kanthaka, and distributes his royal accoutrements—including jewels, a parasol, and a fly whisk—to attendants. A tree spirit (yakshi) serves as a scene divider. 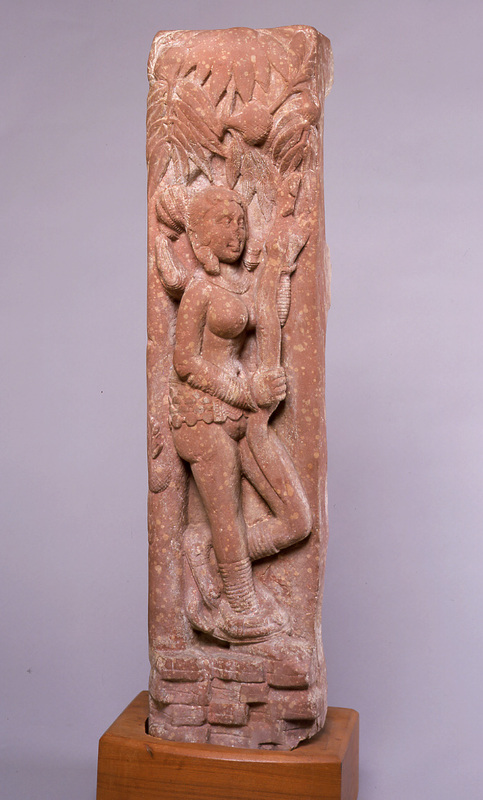 The popular Indian motif of a woman beneath a tree, seen here in this Indian sculpture from Uttar Pradesh, was often used as a scene divider for Gandharan friezes. Such a figure appears next to the scene of Siddhartha saying farewell to his horse Kanthaka ,pictured here. Like Gandhara, Uttar Pradesh was part of the Kushan Empire, but as seen in this comparative work, western art exerted much less influence there and in other parts of North India. 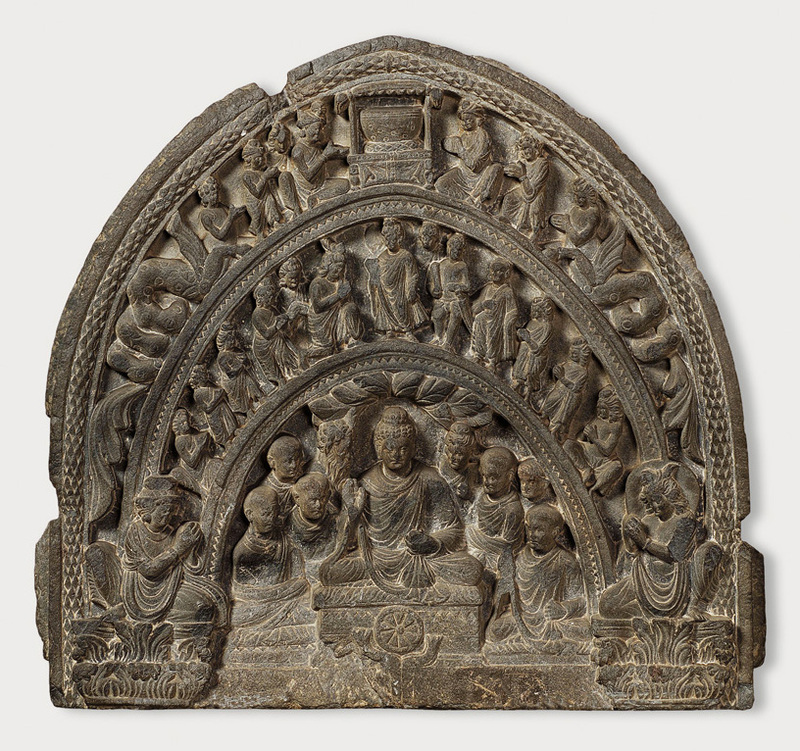 The main scene of this carving shows the Buddha preaching his first sermon to a group of ascetics, his first disciples. The wheel in front of the throne symbolizes teaching, also known as “turning the wheel of the law” (dharmacakrapravartana). The arches above this scene depict the veneration of the Buddha and his begging bowl by the Four Guardians of the World. This stair stringer is decorated with a winged serpent or sea creature (makara). Stair stringers were located on the sides of the steps that climbed up from the ground to the base of the stupa dome. The mythical animal decoration demonstrated that the stupa was sacred to all living beings. This second- to third-century image of the Buddha is representative of what has come to be thought of as the classic Gandharan image. A heavy cloak hides the body and its folds form large concentric curves centered on the right shoulder. The face is elongated, the chin is quite prominent, and the corners of the relatively thin mouth are slightly sunken. The eyes are narrow under a heavy lid, gazing downward, and the wavy hair is gathered into a topknot.